“Today I’m participating in a group blogging! WOW! Women On Writing has gathered a group of blogging buddies to write about finding love in unimaginable places. Why this topic? We’re celebrating the release of Michael French’s twenty-fourth novel. 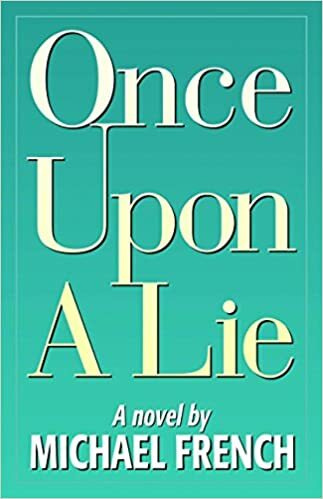 Once Upon a Lie (Terra Nova Books) is an exploration of the secrets families keep, and the ways those secrets can tear a family apart. Growing up in South Carolina, one would expect me to know how to Shag. No, not shag – I’m an American, not a Brit. I mean, I had two daughters, so I knew how to shag – but I didn’t know how to shag. Okay, that’s way too much information and not what I was trying to say. Let me start again – I grew up without learning how to do our state dance, the Carolina Shag – a partner dance done primarily to Beach Music. I loved dancing but as a single mom, I had long outgrown my high school dance moves. It was time to learn more adult moves – I meant to say sophisticated dance moves. Jeez. Getting this story out is harder than I planned. When the time came, after my divorce, to get back into the dating game I decided a good place to start was to learn our state dance. Our local YMCA offered lessons and I signed up. However, with two little ones, a busy work schedule, and a very tight budget, I was unable to attend those first round of classes. Months later, I tried again and with both young daughters in tow, I showed up at the YMCA ready to dance. Settling the girls in a corner, the oldest child with her homework and the youngest her blankie and pacy, I joined the other late bloomers for my first lesson in the art of the Carolina Shag and then the unimaginable happened. On the very first night, I met my husband – the love of my life. I still remember the first time I saw him walk through the door. Tall, dark and handsome wearing black slacks and a red sweater, his dark brown eyes had me at ‘hello’. Over the course of eight weeks, I learned to shag, twirl, spin, and follow his lead. That was nearly thirty years ago. I went to the YMCA to learn to dance, but I found love. Unimaginable. My Mom and Dad met a B’nai B’rith Young Adults dance. When he walked through the door at a BBYA meeting, she told her friend that he was going to take her to the dance. For that reason, Mom was always pushing me to go to dances, so of course I hated them. My girls met their SOs the good old fashioned way – on the job and introduction by a mutual friend. I met my Spouse video dating, which was cutting edge back then but now is more than outdated. I am in the middle of writing a post about it. That’s a wonderful story! Music and dance move all our hearts, and it sounds as if it worked out for many of us. Thank you for stopping by the Cow Pasture to share your story. the memory of falling in love is one of the glues that keeps couples together! Yours is a terrific memory. Aw, thank you Michael and so glad to see you in the Cow Pasture. Lovely story, Sheila. My first contact with the man who was to become my husband was a phone conversation which unexpectedly lasted several hours. It was as though I’d known him all my life. Six weeks later he’d moved in, and that was 28 years ago. What a great story. I love reading all the stories about love. Puts me in a good mood and makes me smile. As always, happy to see you in the Pasture. Ha ha! You definitely had me laughing with that intro. I loved reading how you met your husband. I’ve never tried shagging (the dancing!) but it looks so hard. (I’m in North Carolina 🙂 Have you ever seen that cute movie “Shag” with Phoeobe Cates and Bridget Fonda? Great shagging in that one! Yes, I have but it’s been a long time. Glad you enjoyed the story and happy to give you a small. Nice to have you strolling through the Cow Pasture. You make me want to get up and dance! I enjoyed your story and what a great title! Glad you liked it! Thanks for taking a stroll through the pasture. It’s a pleasure meeting you from away across the ocean. Glad you liked it and I’m thrilled you’ve jumped the fence! Welcome to the Cow Pasture. Like a real-life Dirty Dancing story, Sheila! Congrats on nearly thirty years! I fell in love with my wife at first sight in college; we had our first date twenty years ago this past January. I think, in my “old” age, I’m becoming something of a romantic: Nothing makes me happier than an enduring love story. Thanks Sean, glad you liked it. The first one didn’t work out but thank God for second chances! He’s a keeper! always glad to see you in the pasture. I’ve never heard of the Carolina Shag–it looks really complicated but fun! What a great way to fall in love. Many couples have a song but you two have a dance! It was a great time! I’m glad you liked the story and thanks for taking a stroll through the pasture. Please Come again. What a romantic story. Never heard of that dance but do love to dance. Thank you. I’m glad you enjoyed it and if you haven’t heard about the Shag, you’re not from the Carolinas. So happy you took a stroll through the pasture. Neat story…and I want to learn! I don’t know the area you are located but if it’s in the South – lessons will be easy to find. Thanks so much for stopping by the Cow Pasture and taking a stroll.